Late this afternoon the City of Costa Mesa issued yet another press release. 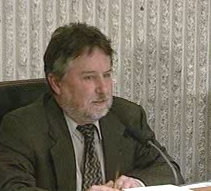 This one contained the text of a prepared statement by Mayor Gary Monahan that attempts to explain why he chose to stay at his pub, mugging for cameras and pulling beer pump handles on his busiest day of the year instead of going to City Hall to oversee the biggest tragedy in the history of the city. He failed. In his feeble excuse, the full text of which is below, he makes no mention of discussions with the police officials at the scene, nor any discussions with Tom Hatch at that time. He mentions only discussions with "two fellow councilmen" - that would be Jim Righeimer and Steve Mensinger. Mensinger arrived on the scene at 4:12 p.m., consulted with Righeimer, Hatch and the police, then adjourned into City Hall at 4:30. 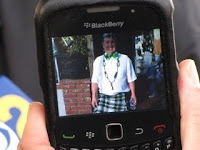 Nick Beradino showed the cell phone photo of Monahan a t his pub in his kilt mugging for the camera at 5:36 p.m., more than 2 hours after Huy Pham leaped to his death and more than an hour after Mensinger arrived on the scene. Monahan had plenty of time to leave his pub, change his clothes and get to City Hall to take charge of this unfolding tragedy. Instead, he left it in the hands of two lightning rods, Righeimer and Mensinger. He made a management decision to do what he's done his entire political career - put what is "good for Gary" ahead of what is good for the city. No word yet from the 4:00 p.m. press conference... I'll keep checking the city web site, but I expect Joe Serna will provide us with some information in the Daily Pilot. Yesterday was a heartbreaking day for all of us call Costa Mesa home. What is lost in all of the rhetoric is the fact that this is a tragic incident in the midst of a very difficult situation. our city lost one of it's brethren, and it certainly will take some time for it to heal. Before I was informed of yesterday's incident, the union decided to take despicable advantage of this tragic situation to advance their agenda. Had I known what transpired, I never would have agreed to pose for photos or engage in any revelry. I became informed of the situation and contacted two of my fellow council members, who were on the scene, and quickly brought me up to speed with the details of the situation. After learning of the volatility of the situation, I realized that my presence could further inflame and escalate the situation, and decided not to visit City Hall. I remained in constant communication with my council colleagues, and was kept informed as the rest of the day transpired. I understand the anger and hurt surrounding these potential layoffs. I- and my council colleagues - have not made these decisions lightly, and we realize that our decisions are impacting families. As Tom explained, we are working with staff to work through this very difficult situation, and I am hopeful that we can eliminate the politicization of this tragic incident, and work together to heal our great city. Video clip regarding CEO conference is posted on City's Website few minutes ago. Video regarding CEO conference is posted on the City's website. Nick Beradino is a worthless excuse for a human being. This conduct will not sit well with average Costa Mesans. I live in CM but my kids attend HBHS. On my way back after dropping them off this morning (3/18) there were police cars and city workers gathered around the "Welcome to Costa Mesa" sign on Adams. (right after you cross the wash) The sign was splashed with massive amounts of red paint and over the red were black spray-painted words, one of which appeared to be "politics"or "politicians". By the time I drove past the sign this afternoon it had been re-painted to its original state. I wonder if it was related to the suicide and lay-offs. It's sad that our Mayor doesn't realize he's a pawn in this political arena. How could he not know? Who else would those involved call...but the Mayor? I am so disappointed in the person I once called a friend. When Righeimer and Mensinger throw him under the bus...who's gonna lift it off him? How much did the city have to pay to outsource this PR BS? We drove by Gary's Pub about 4:30, on Thursday. He was in his regalia, outside the entance on 20th Street. A Costa Mesa Police Car was parked on the south east side of the street. He was speaking to two men in matching dark colored T shirts. All laughing, talking in a jovial what appeared to be a jovial mood. My friend who was driving, shouted out "Officers arrest that man in the dress", not realizing how cogent this ironic remark was in light of the tragic event under Gary's negigent watch. Gary smiled and shook his head at the passing remark. Another lie from the leprechaun. At least we know he wrote this one since the grammar was terrible and the logic comical. It was simply a pathetic attempt at PR and Mr. Hatch if you are reading this... you are turning you are quickly turning yourself into a "yes" man who bows down to this council's every wish instead of defending your city, your staff, and your dignity. Please grow a spine quickly. Lies, Lies, and more lies. Regardless how angry employees would have been you respond no matter what when your City has an emergency especially a death. If you can't stand up and be the mayor then get out! Your no response shows us employees who and what you exactly are. I hope the residences of Costa Mesa now see what you are. Nick Berardino is not my favorite person in the world, but he was simply doing his job. A job, by the way, the media should have done. Why is the leader of the city not at an event where a city employee lost/took their life? I understand St. Patty's Day is a busy business day for Monahan and I am glad to see he is making money. However, when you want and take on the responsibility of leadership, especially a mayor position, certain duties go along with that, one being their for those you lead. Monahan should have changed his clothes, went to city, been seen for an hour or so, then returned to his other responsibility. A leader can't pick and choose the responsibilities they wish to have. Bottom line is he failed. He failed even more when he allegedly made the completely insensitive comment regarding hiring and firing people everyday. Any respect I had for him is gone. We advise our children to take ownership for poor behavior and their mistakes, the mayor should subscribe to these same values. Instead, he transfered blame and accountability for his lack of judgment. We need better leadership from a mayor. He should resign.